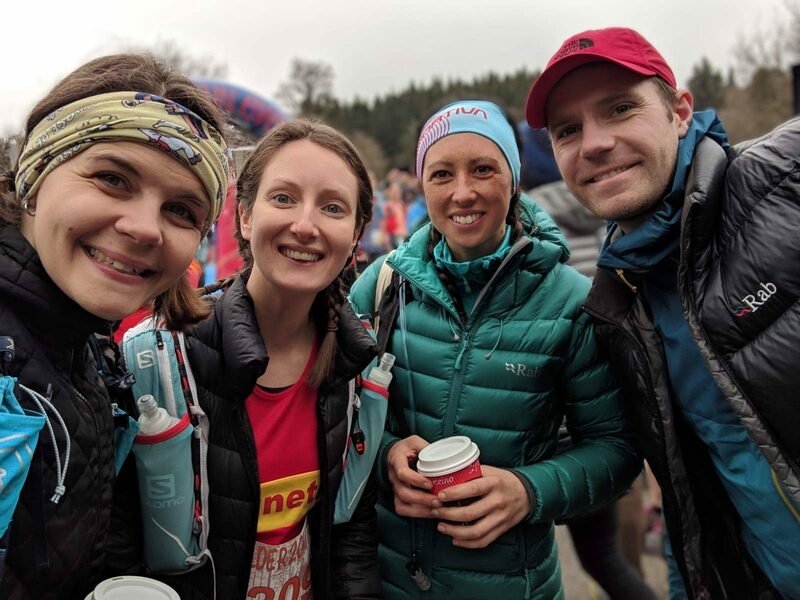 It’s become a tradition – because doing something two years in a row counts as that – to find a race around Steph’s birthday and celebrate by running it together. 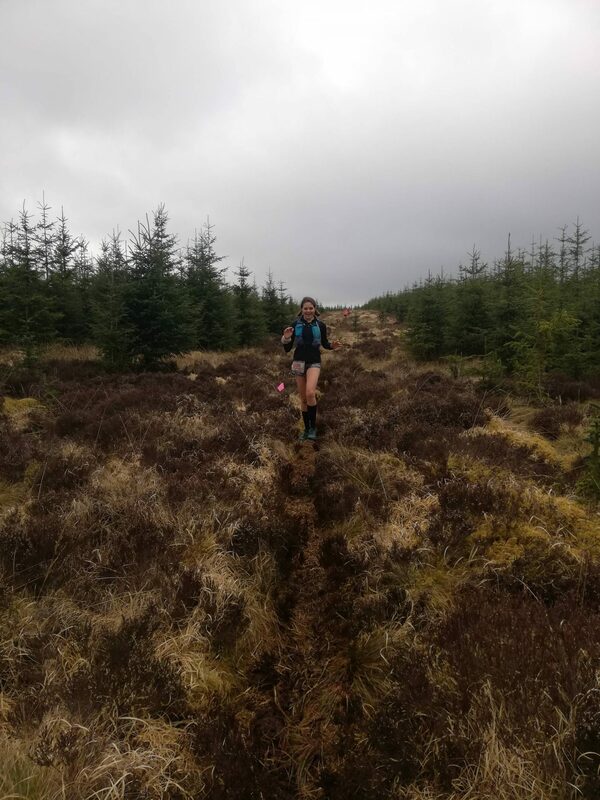 Last year we tried the John Muir Ultra and this year, falling exactly on her birthday, was the Kielder Ultra Trail organised by High Terrain Events. 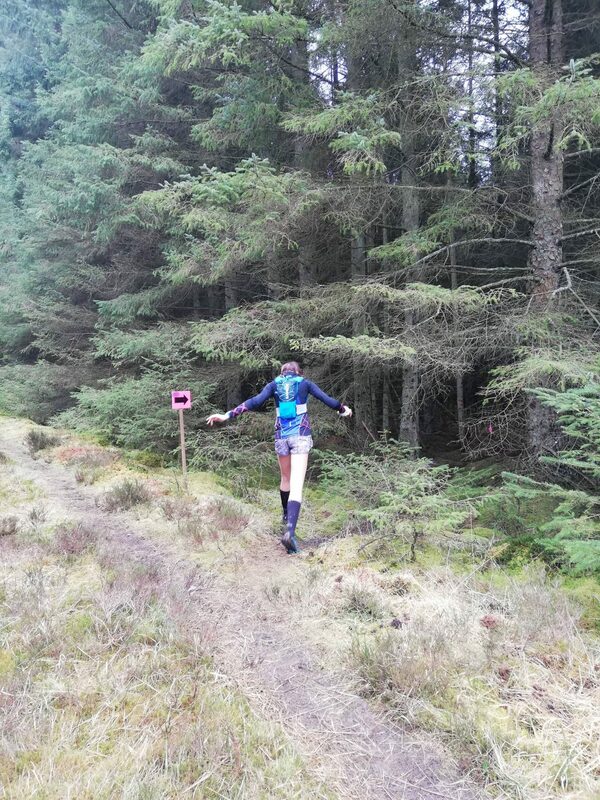 As well as 50 and 100km events, new to High Terrain Events in Kielder was a 32km/20 mile option. This was perfect for us both as Steph has 10 days until Boston marathon and I have 3 weeks until MIUT. Steph in particular was being sensible and we, as we always do, decided to have fun, take photos and enjoy the ride. It was a birthday celebration after all. Kielder Water and Forest is in the heart of Northumberland – a few hours drive for me, a little longer for Steph who lives in Windsor. Of course we made a weekend of it and with the race on Saturday morning we met each other, plus a bunch of our friends, on Friday evening at our Airbnb. 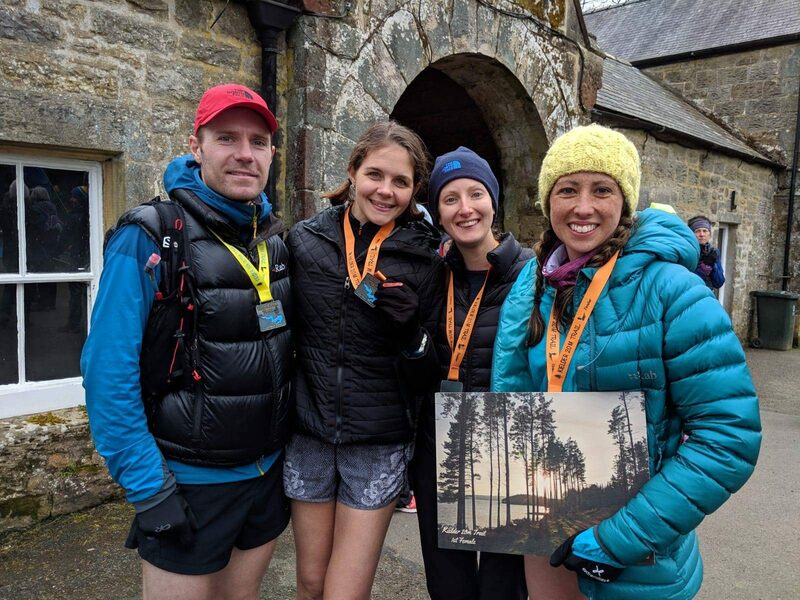 We ate together then slept, waking to have coffee and breakfast before four of us jumped in the car to drive to Kielder Castle for the race start. Liam was racing the 50km route so started before us at 9.30am. The 100km had started at 6.30am so those runners were well on their way when we arrived for registration at 8.45am. We picked up our number, race tee and reusable cup, used the loos then headed to the start line to see the 50km runners off. It was dry, cool – about 6C – and a little cloudy, but the race organiser announced this wouldn’t be changing throughout the day, so I hoped my waterproofs would stay in my pack. 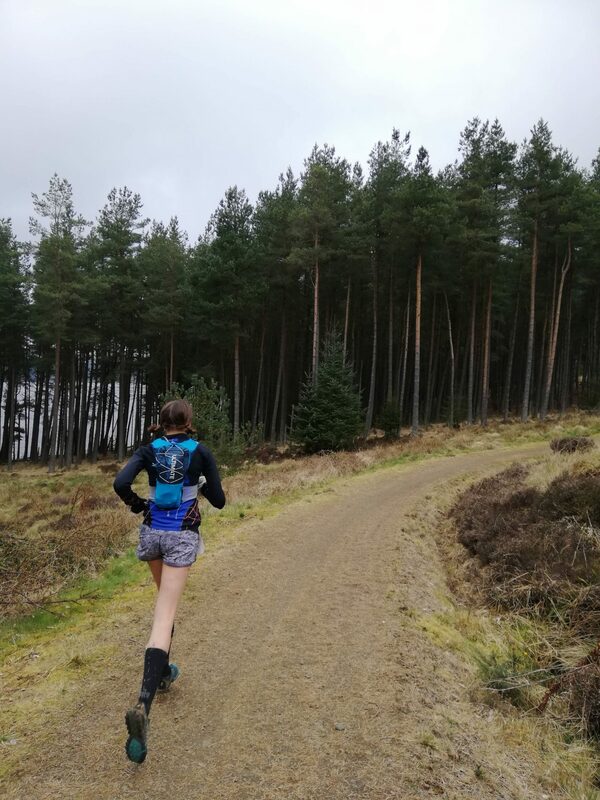 I’d decided on a long sleeve – a trusty one from Uniqlo – and my Carnethy vest, shorts, long socks, my 5l race pack and Salomon Sense Pro 2 trail shoes. I had my gloves on to start but these were quickly popped back in my pack once we got going. 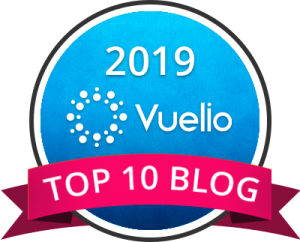 Between the start of the 50km race and our 10am start, we dropped off extra layers in the car, visited the loo again and got some photos for the blog. We were then briefed, told to follow the signs and flags and then set off, racing away from the castle, down the hill past the car park and onto the trails. We set off following Viaduct Wood and were with our mate Fran for about a kilometre when the climb started and she left us in her dust! Climbing to the top of Castle Hill we took it easy, slowing to a walk, but others behind us were obviously doing the same and we maintained our position, 2nd and 3rd ladies. Passing Devil’s Lapful the views opened up and as it was quite a clear day, with just a little hanging cloud, we could see the valley stretching out wide. From here we hopped onto the blue mountain bike single track that twisted and turned its way around the trees and was super fun! Yes we took some photos! So another lady passed us, but hey we were running birthday party pace and loving it! After an unexpected river crossing – ok, a little burn, but our feet got wet! – and a long old stretch of forestry road, we were climbing to the top of Black Belling fell, with more views that this time stretched out letting us see Kielder Water. We knew the first checkpoint was down at the water edge by the dam, so we were close, and a beautiful long descent, led us all the way there. A fully stocked table of treats awaited us at checkpoint one (14km in) and to Steph’s joy, a toilet block! 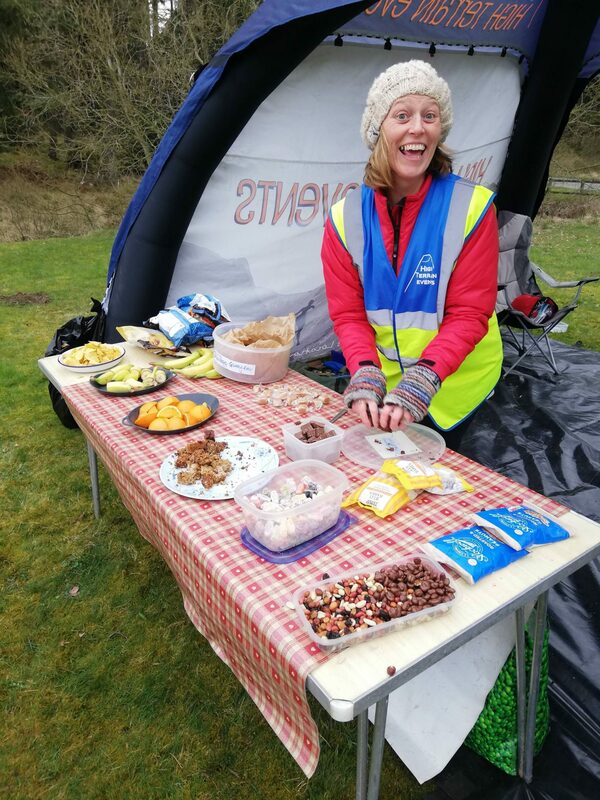 As the friendly marshal re-stocked the table with more brownies – so the photo looked better, her words! – I tried some homemade vegan flapjack and Steph used the facilities. A smile for the photographer – that in fact turned out into him capturing us stuffing our faces – and we were off, well on our way to half way. Leaving CP1 we knew that most of the ascent was done and dusted. The remainder of the race route wove around the edge of the water and stuck to the main walker’s path, wide and open. Not my favourite. 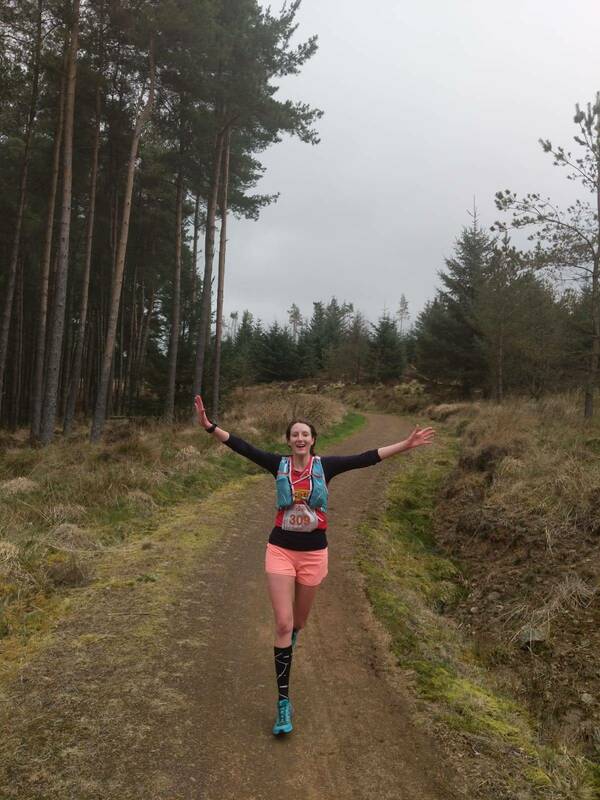 A little way along, we found our first countdown – 10 miles to Kielder Castle, the rock read – to the finish line. 10 miles, 9, 8 and then when we were sure we had less than 10k to go, 7, 6, 5 mile markers just didn’t appear. Oh well, we were enjoying it too much to care. We were on route, the little pink flags and arrows showing us the way. Steph had popped the GPS tracker into her watch, so we knew that there was a final hill to climb before a nice downhill finish. It came with less than 5k to go and was a long, steady climb, but on my least favourite terrain – small, rocky, wide fire roads. Waiting at the top was a friendly marshal, which raised our spirits, despite cramp creeping into my calf muscles. It was all downhill from here. Fran we knew would be waiting for us at the finish line and how would Liam be getting on? 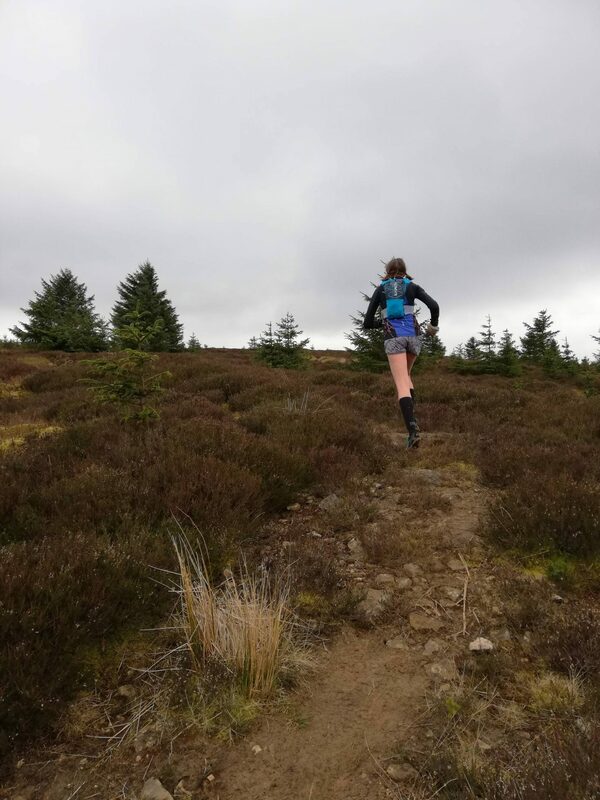 The last few kilometres flew by, downhill on softer, kinder trails, skipping over a bridge and through a field, we could see the finish flags. 32km came and went on my watch and we were still running. 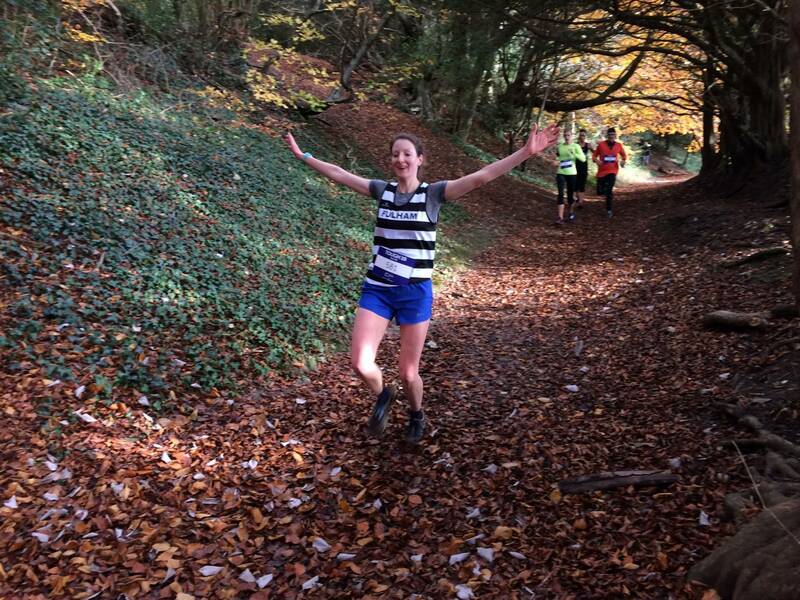 Up to the castle, through the arch and crossing the finish line hand in hand as we always do. Together. Fran was there as we hoped and had bagged first lady home which we were thrilled about, and with two ladies just ahead of us, Steph and I claimed 4th and 5th. Not bad for a birthday day out! 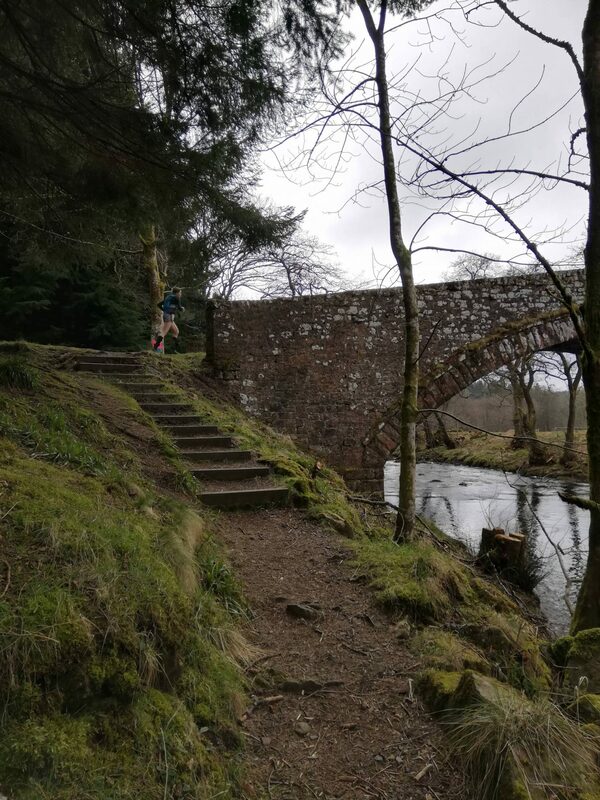 Only two 50km runners had finished so we also got to see Liam cross the finish line, as well as some Carnethy club runners I’d met at the start. We were well looked after at the finish with coke, water, lots of food and a cosy cafe to sit in while we waited for the prize giving. Prizes claimed we bundled into the car again and headed to the pub to meet with friends, medals around our neck, ready to continue the weekend of birthday celebrations. I love that photo of the Marshall! Beautiful write up. I’d definitely do a Higher Terrain event again. What a great way to celebrate a birthday! Such beautiful scenery there.